Lactitol is an artificial sugar alcohol (polyol), it does not exist in nature. It has a good flavour with no after taste. It has 2 calories per gram, 50% of sugar but it has only 40% of the sweetness. So, on it's own, it is of no special use as part of a calorie controlled diet, sugar is better. It does, however, have a very low glycemic index and is consequently suitable for diabetics. It also has other unique properties which make it suitable as a replacement for sugar is certain applications. It is used in much the way as other sugar alcohols such as Xylitol or Sorbitol. In the food industry it is valuable as an ingredient in ice cream, biscuits, chocolate and chewing gum and candy. It is easy to work with, dissolves at a low temperature, and provides bulk in conjunction with high intensity sweeteners like sucralose. It is not hygroscopic, it does not absorb moisture, so it is useful for keeping biscuits and cookies fresh and crisp. It has a very low glycemic index (Only 3 - sugar is 65) and this makes it suitable as part of a diabetic diet. Like all sugar alcohols it is not metabolized by bacteria in the mouth and so it does not contribute to tooth decay. It has an excellent taste and has an appearance and texture very similar to sugar. It is heat stable and ph stable and is suitable for cooking and for processed foods. . It also has been shown to have prebiotic qualities. Taken in moderation it supports the growth of bacteria in the colon which are beneficial to health. It has a laxative effect and in some individuals can cause cramps, flatulence and even diarrhea. Probably best not to consume more than 20 gm per day. There is no guideline Acceptable Daily Intake set by the FDA. It has a mild laxative effect so moderation is the key. The Scientific Committee for food EU found it to be safe up to 50gm per day, though 20 to 30gm would be less likely to cause problems. Danisco are a supplier of Lactitol. Purac sell a product called Lacty. It is expensive. 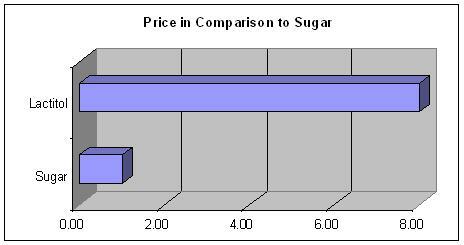 On the bulk market it is 8 times the price of sugar.This makes it one of the more costly sweeteners used commercially. Only small quantities are typically added to food products. to achieve desirable qualities such as texture, moisture resistance and appearance. Tiny market share. Perhaps 0.05 million tons per annum giving a share of about 0.03% or about 3,000 times less than sugar. One spoon of sugar contains 16 calories. To achieve the same sweetness it would be necessary to consume 20 calories of Lactitol, so there is no saving at all. However it is useful as a bulk sweetener. This means that it adds bulk and texture to high intensity sweeteners (saccharin etc) in the absence of sugar. Unlike most other sugar alcohols it does not have a cooling effect on the mouth. This is an advantage when used as a direct replacement for sugar in chocolate and cakes etc. (Cooling is desirable in chewing gum and lozenges etc) It does not absorb moisture and it is able to extend the shelf life and crispness of products. It is also used an an ingredient in medicine for the relief of constipation. It is metabolized to galactose and sorbitol in the upper intestine so it provides the body with about half the calories of a normal carbohydrate, with a much lower glycemic index and load. Lactitol is approved for use in most countries. Recognized as a sugar alcohol by the FDA and classified as GRAS (Generally approved as safe). Approved in the EU as E966. Most people have never heard of this sweetener, yet it is well known to the food industry, and is used in a multitude of products. Excellent taste and texture. No aftertaste. However no saving over sugar in terms of calories. Is useful for diabetics and it is harmless to teeth. But it can cause discomfort for some people if taken in excessive quantities. Beneficial to colon health if consumed in moderation. It is a prebiotic.